Apple today seeded the third watchOS 2 beta to developers, just over two weeks after seeding the second watchOS 2 beta and a month after announcing the new operating system update at its Worldwide Developers Conference. watchOS 2 requires iOS 9 and can be downloaded over-the-air through the Apple Watch app on the iPhone by going to General -> Software Update. 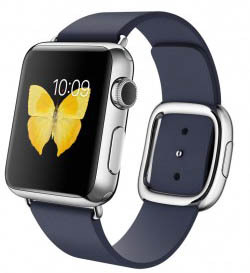 watchOS 2 is the first major update to the software that runs on the Apple Watch. The new software brings many new features that Apple Watch developers can take advantage of, including native apps that run on the Apple Watch itself instead of the iPhone. It also allows developers to access the Taptic Engine and a number of other sensors in the Apple Watch, including the heart rate monitor, the microphone, and the accelerometer. So if you go to a doctor and he/she misdiagnoses you, would you say that the quality of medical care has matured because we know more diseases now, hence it's OK to be misdiagnosed? Apple has > $400 billion in their pockets. There is no excuse for rookie mistakes like that. They can hire all the talent in the world if they wanted to, to make sure major mistakes don't happen, yet major mistakes continue to happen. Yes, but never in the history of the universe has anyone expected a BETA to be polished software. This is why it's not available to the general public. It's not even a public beta yet. The purpose for THESE beta builds are so that DEVELOPERS (like me) can start building apps for the new SDKs and report bugs to Apple. They're not for a bunch of whiney early adopter users to complain about Apple's software quality. I think I'll bite the bullet and install beta 3 on my Watch. The previous 2 betas were apparently really bad but...I'll give it a shot because why not. It's a beta. It's not supposed to be nor expected to be stable. If you're seriously going to whinge about beta software behaving like beta software, then I really don't know what to tell you. Like I said, you go build one and we'll see. I suggest that we agree to disagree... it seems that everyone is so focused on using my statement in relation to the betas alone, not accounting previous public releases, that it makes no sense to argue. Ugh, I can't stand it when people say that. It hasn't decreased... Its just that as you get into more lines of code, the more bugs will appear. It's the whole point of a BETA. For you to test it and tell them the bugs. You try making a Mobile OS and I guarantee you there will be bugs, if you can even do it at all. So no, the quality of their software hasn't decreased, it's just matured. In all essence, I like iOS 8. It's one of the most updates they've ever had. And that's because of the betas and the feedback. And iOS 9 will be even better. So will watchOS 2. That's why they specifically say not to install on a device that is used daily. If you're gonna complain, go get a new iPhone and new AppleWatch and install that stuff on there. It's not a big deal. 5) when it pop ups the backups available - restore the iOS 8 / Watch OS 1.0 backup. Source; It worked for me. Yeah you're the only one in the whole world who had this work. Congratulations. you DO understand that you CANNOT recover from Beta 3 if you find it not useable! No DFU mode found yet! Hi Everyone. I sat through the pain of beta 1 and 2, and can confirm that my Watch is back to life! beta 3 restores the Taptic Engine!!!! !